Fanuc ArcMate 100iC six-axis robot arm. 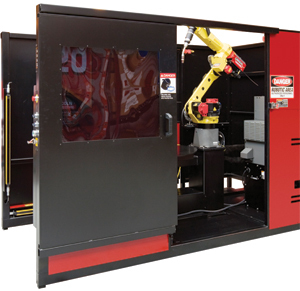 The system features servo-driven positioners that are nearly maintenance-free—no mechanical components to fail such as cylinders, brakes, controls, etc. System 20 offers a 58-in. dual-zone work system that can handle 600 lb. per side, with an index time of only 2 sec., delivered by the Fanuc-driven servo positioner. The modular design can start off as a two-sided system and be modified later to become three- or four-sided for small part profiles. With a small footprint designed to optimize floor space, its steel skid structure is equipped with fork pockets for simple placement anywhere on the shop floor. The cell comes equipped with features designed to improve the work environment. The control panel delivers push-button controls for ease of operation and large roll-a side doors for simple programming. PC board safety controls and integrated operator safety devices provide additional protection. Value-added features include storage drawers for tips, nozzles and small tools, as well as work surface cut-outs to accommodate fixture utilities.